Easy, Affordable, Automatic. Works On Any Combine. If precision farming is in your future, or something you already do, a yield map is the single most important piece of data there is. It is the key input to next year’s agronomy plan and the current year’s report card. We make it easy and affordable for farmers to generate yield maps. Our retrofit yield monitor can be user-installed quickly on any combine. The FarmTRX Mobile App displays live harvest data & uploads automatically to our web-platform. The FarmTRX Web App immediately generates high-quality yield maps. 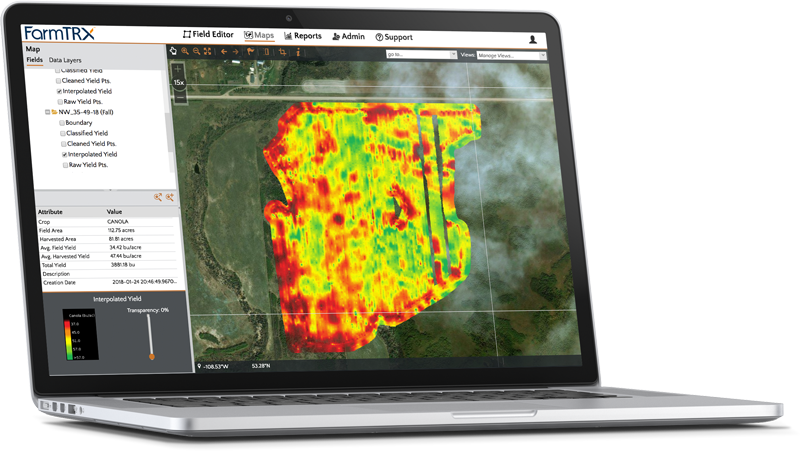 Easily view your yield maps, share them with your agronomist, or export to other farm management software. FarmTRX treats all data as confidential, we do not share or sell your yield data. Easily user-installed in under 4 hours. Includes GPS antenna, yield sensors & data logger. Use any Android phone or tablet (iOS available Q2, 2019) for real-time in-cab display and setup. Your yield data is automatically uploaded to the web, ready for you to easily view. Designed By Farmers, For Farmers, & Made in Canada. 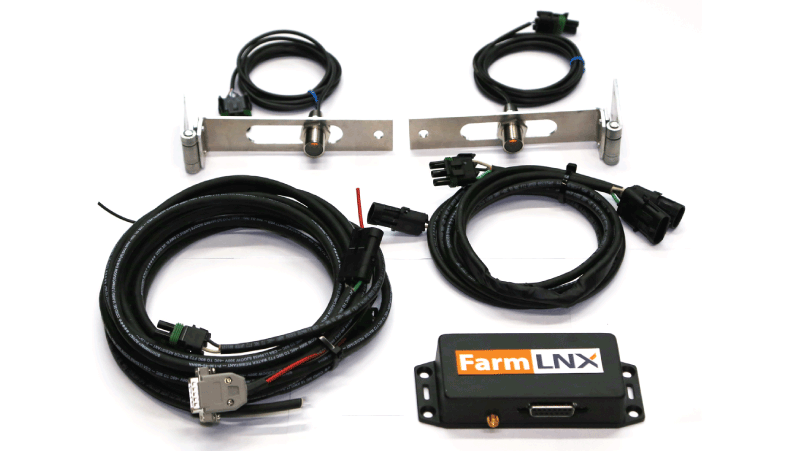 The FarmTRX Yield Monitor can easily be user-installed on any age/model combine in only a few hours using common tools. The yield monitor features a built-in GPS antenna, bluetooth connectivity, and memory to store 5+ years of yield data. It uses optical sensors mounted on the clean grain elevator to measure yield, which are much more robust, serviceable, & user friendly than impact plate style sensors. FarmTRX Yield Monitor: Logs yield data & stores it for 5+ years. Bluetooth connection for pairing with mobile devices. Upgradeable with moisture sensor in 2019. Optical Yield Sensors: Mounts on clean grain elevator and measures height of grain on each passing paddle. 1 season (3 months) subscription to FarmTRX web application included. Starts on first yield data upload. Moisture sensor will be available Q3 2019. Contact us to be notified of pricing and release date. 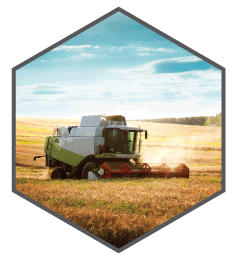 The FarmTRX Yield Monitor is compatible with any combine with a clean grain elevator. Your combine does not need to have a GPS antenna or sensors already installed. The FarmTRX Yield Monitor can be user-installed using common tools in under 4 hours, with many installs happening under 2 hours. FarmTRX is proud to build and assemble our Yield Monitors at a Canadian owned and operated manufacturer locally in Elbow, Saskatchewan. Our manufacturing partner employs Canadians, and produces an incredibly high quality product that we are confident in standing behind. 4 years ago, Farmer and Technologist Perry Casson built the first FarmTRX prototype in Medstead SK. He had begun variable rate trials with Cavalier Agrow, and wanted a way to measure the outcomes of his trials. Soon after building his prototype he garnered interest from local farmers and agronomists who were looking for exactly what he had invented – a Yield Monitor that was affordable, easy to install, and most importantly – easy to use. Since that time, the technology and hardware components have evolved significantly, and collaborating with Troo Corp now provides a powerful web mapping platform. Bennie Dunhin – Agronomy Manager, Cavalier Agrow Ltd.
Wirelessly connect to the FarmTRX Yield Monitor over Bluetooth from any Android smartphone or tablet (iOS available Q2 2019). View real-time yield data, and easily update harvest parameters on the go. Crop calibration takes only 2 minutes per crop, per season. After harvesting, use your phone/tablet to wirelessly upload yield data to the cloud – no memory cards required. Your yield maps will be ready as soon as you go online. 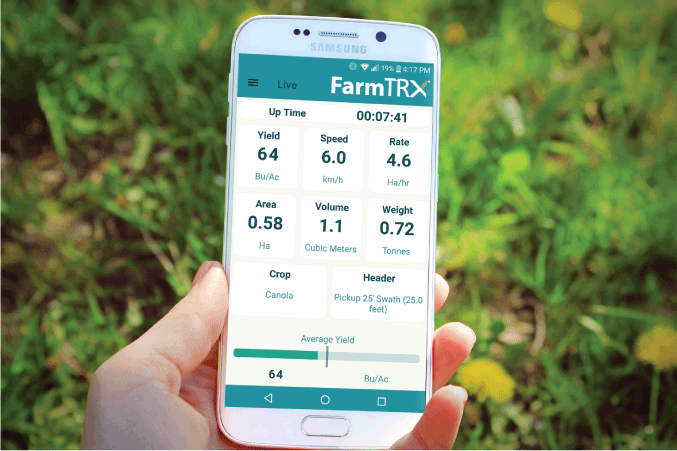 The FarmTRX Mobile App was designed to clearly display live yield data, as well as allow users to update harvest parameters such as crop, header, and units. Yield, as well as other cumulative statistics are show on the main screen, and other functions such as calibration are also easily accessible. The mobile app connects to the Yield Monitor via a wireless bluetooth connection. 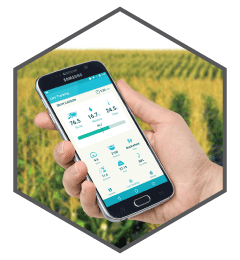 After you have finished harvesting the mobile app will also wirelessly upload yield data to the cloud – over WiFi or even cellular data. Note: yield data is always recorded on the data logger regardless of a mobile device being connected. Calibration is a simple process that can take less than 2 minutes. The quickest way to calibrate is to harvest a known amount of your crop (eg. 1 full hopper, or measured from a weigh wagon), and enter the actual harvested volume on the calibration screen. This only needs to be done once per crop, per season. Exact calibration is not necessary, since the FarmTRX Web Application makes it incredible easy to correct calibrations post-harvest, even when multiple combines are not exactly calibrated. The FarmTRX mobile app is compatible with most Android devices newer than 4-5 years old. The iOS app is scheduled to be available Q2 2019. Leave The Data Processing To Us. Get instant results. Yield maps appear on the web just moments after uploading. 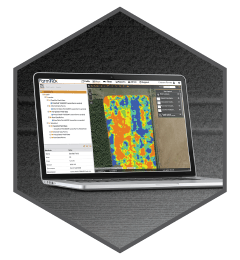 No more fumbling with SD cards, no more messy data – just precision yield maps & farm reports. Your data gets cleaned, processed, and interpolated in seconds. Easily share your results with your agronomist and see how your fields really performed this year. FarmTRX does not sell or share yield data. Data and maps are treated confidentially and remain the property of the farmer at all times. The FarmTRX Web Application was designed to make viewing and sharing your yield maps easy. All you need to do is set up your field boundaries and your yield maps will be automatically generated. If you didn’t calibrate your monitor – that’s no problem; quickly re-calibrate your fields by entering your known total yield, and instantly your data will be corrected. We make it easy to calibrate multiple combines on the same field, view reports, and export your data to other farm management systems. No longer worry about needing to perfectly calibrate your Yield Monitor in the field. Get it close, then focus on harvesting. Easily re-calibrate your fields from the Web App, simply by entering the total known yield for your field. This is especially useful for calibrating multiple combines, eliminating any “striping” artefacts. Export your field data in .SHP format files. This makes it possible to open with other management systems, such as SMS or others. Accurately calibrating 2 or more combines is nearly impossible in the field. That’s why we built in the ability to correct your data through post-processing, allowing you to correct any skewed data from imperfect calibrations..
“FarmTRX enables growers to create yield maps and offers a cloud storage option that provides a catalogue of all of their mapped fields sorted by year. FarmTRX was awarded a sterling innovation award at the 2018 Farm Progress Show. Submissions were qualified by the Canada’s Farm Progress Show Innovation Committee and evaluated by a panel of industry judges. The highest-ranked innovations will received Gold Standard Award or a Sterling Standard Award.